Like all areas of design, trends eventually come back around and the Botanicals trend has come back bigger and stronger than ever. Pretty flowers and plants, incorporated with butterflies and birds are set to take over our walls and accessories this spring and summer, to give a welcome break from masculine looks that have dominated interior design over the winter months. There is a variety of ways to achieve this look, such as wallpaper, art, plants, and accessories so this look is perfect for everyone. This look is a restrained and subtle take on the trend, using only a few green plants and moss green bottles and vases. The distressed mini step ladder makes an interesting side table and matches the flaking walls perfectly. These aspects have been contrasted beautifully with a simple Aubergine coloured chair and pretty scatter cushions. The mix of pretty botanical wallpaper and industrial edged furniture adds a modern twist and stops this style looking too chintzy. The days of flying ducks on walls may have gone but birds are defiantly still around to stay. You’ll find them on walls, curtains, and scatters in bold summer hues and patterns. Butterflies have been around in interior design for some time now, with many designers using motifs in prints and wallpaper, even well-known artists such as Damien Hurst have been known to use these pretty insects in their work. The strong turquoise and bold blue colours of these butterflies would work well on muted walls, or you could try a bright wallpaper to create a striking feature wall. This bold take on the botanicals trend is much more retro. The measuring beaker used as a vase takes the trend a step further whilst adding a light-hearted twist to the overall look. These bold clashing colours and patterns may not be for everyone but they certainly make a statement. A full on yet sophisticated take on the trend using shades of green and dark woods. 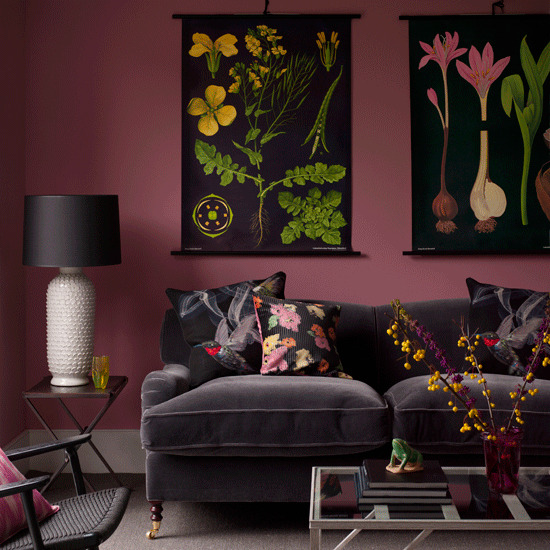 This look has taken the bold yellows, reds and greens, typical of the botanical trend but contrasted them with lots of deep purples and mauves. Although quite dark, this look still has that distinct tropical look of the botanicals trend. If you would like give your furniture an update with reupholstery or loose covers, in designs including like this trend, contact Plumbs today for a FREE no obligation quotation.